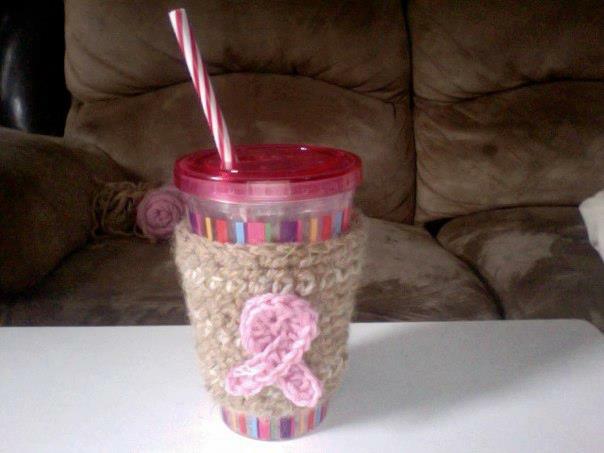 Note: 1 ball each of A, B, and C will make 2 Cup Cozies. hooks or size needed to obtain gauge. 12 sc and 13 rows = 4″ [10 cm] with smaller hook. in ring with sl st into first ch. sl st to first sc. 6th rnd: As 2nd rnd. 10 sc. Rep from * once more. Join B with sl st to first sc. 8th rnd: As 2nd rnd. 9th rnd: As 3rd rnd. Fasten off. With smaller hook and C, ch 18. 1st rnd: 1 hdc in 3rd ch from hook (counts as 2 hdc). 1 hdc in each of next 5 ch. 2 hdc in next ch. 4 hdc in next ch. 2 hdc in next ch. 1 hdc in each of next 7 ch. Fasten off. 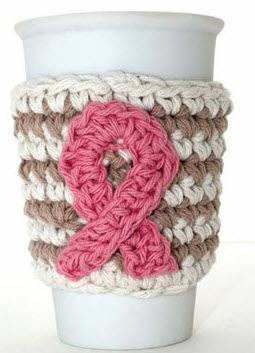 Cross ends of Ribbon and sew to Cozy as shown. needed to add this picture . after i posted this blog my friend Amy made this and only took her about 20 min. but i wanted to post this. Thank you amy for the picture.